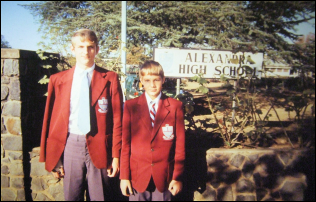 Foreword: It certainly didn't seem like it at the time, but I believe something that has helped me tremendously was the discipline I received in these two South African high schools—something today's schools know nothing of. It was excellent training—especially during the teenage years. We were taught to respect authority—even our peers, in the form of prefects. We learned how to be polite, have manners, show respect for our elders, and to be careful what we say and do. Looking back, I wouldn't trade the caning (on three different occasions, and yes—it hurt, but frankly, we deserved it and we survived just fine! ), hair-cut checks, and lectures about our attitude for anything. "The discipline was certainly what I needed. At home it was just raised voices and being sent to my room, which enabled me to switch off. At school, I had to face consequences and get into line. I would have done anything to put off being caned...but could see the sense of it even as an 11-year-old. Immediacy, completion, a fresh start—all those things made it a useful method of enforcing discipline." The only aspect in which I feel my high school days were detrimental was in relating to/interacting with girls. 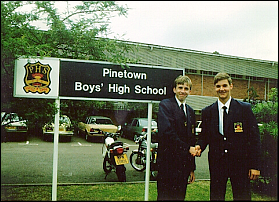 The majority of my teen years were spent at these two all-boys' schools, and after matriculating, I was (and still am) rather inwardly shy around women. Had I been rubbing shoulders most of the day with guys and girls throughout high school, I think I would have seen a marked improvement in relating to, and interacting with them, as well as dispelling some fears and preconceived notions about them. In addition, while it would probably have been distracting, it certainly would have helped motivate me to work harder in class. I think it would also have proven to be a greater deterrent to the frequent profanity and sexual innuendo that sadly characterized the school grounds.